Fuel cell vehicles made their world commercial debut in mid-December, possibly setting the stage for a new wave of environmentally friendly cars. Because FCVs runs on hydrogen, filling stations that supply the element are essential for promoting widespread use of the vehicles, which emit no carbon dioxide. 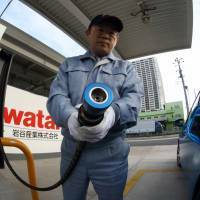 Japan at present only has a handful of commercial hydrogen stations, but there are plans to boost the number to 100 by the end of March 2016. Interest in establishing hydrogen stations is growing not only among existing gasoline station operators, but also among firms in other fields, including city gas providers, a convenience store chain and automakers. But industry observers and operators of such stations say the nascent business still faces many challenges, including high construction and running costs, regulations and lack of space in crowded cities. “First of all, it’s a basic premise that there must be enough stations available to serve the number of FCVs in use. It’s not about which has to come first. There needs to be a win-win situation for both,” said Takefumi Ishikura, chief manager of hydrogen station technology development at Tokyo Gas Co.
“But when you just look at the stations, reducing their (construction and running) costs is the biggest challenge. I think any station operator would agree with that,” he said. Building a hydrogen station costs about ¥400 million to ¥500 million, compared with the ¥100 million required for a conventional gas station. The government has offered subsidies of up to ¥280 million per station this fiscal year and plans to continue the support, but “you can’t depend on subsidies forever,” said Ishikura. Hydrogen stations require dedicated equipment, including dispensers to inject the gaseous element into cars, hydraulic accumulators to store the chemical, and compressors. Production costs are high, however, because equipment orders are piecemeal, instead of in large volumes. 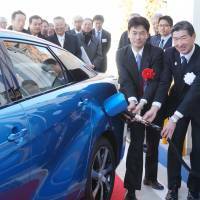 Tokyo Gas opened a hydrogen station in Nerima Ward, Tokyo, in December, the first such commercial operation in the Kanto region. Major gas station operator JX Nippon Oil and Energy Corp. and city gas suppliers Osaka Gas Co. and Toho Gas Co. also plan to build hydrogen stations, as hydrogen is mainly produced through fossil fuels like oil and natural gas. Carbon dioxide is also produced when making hydrogen through fossil fuels. 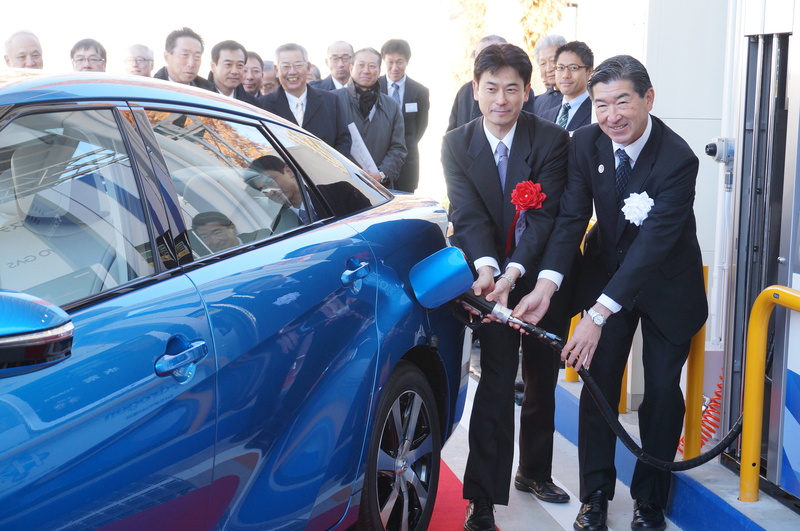 JX Nippon Oil and Energy hopes to open 11 hydrogen stations by April. Tokyo Gas is taking a more cautious approach, looking to open only one more facility in Urawa, Saitama Prefecture, at this point. The hesitance by Tokyo Gas is because it is unclear how many FCVs will be on the road in the near future, making it difficult to order the necessary station equipment in large volumes, Ishikura said. 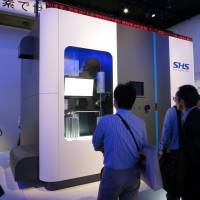 Koichi Oyama, senior manager of Deloitte Tohmatsu Consulting Co. and a consultant to the auto industry, said firms making hydrogen station equipment are also wary of investing more to expand their business. “I hear that opinions are split among the companies. One side says firms should actively promote hydrogen-related businesses because the government is helping. But the other urges careful observation to see how the situation evolves, because it is still unclear if FCVs will be in widespread use five or 10 years from now,” he said. Deloitte Tohmatsu predicts that annual sales of fuel cell vehicles will reach 50,000 units in 2020, 200,000 in 2025 and 400,000 in 2030. To reduce costs, hydrogen station operators hope the High Pressure Gas Safety Law will be relaxed. 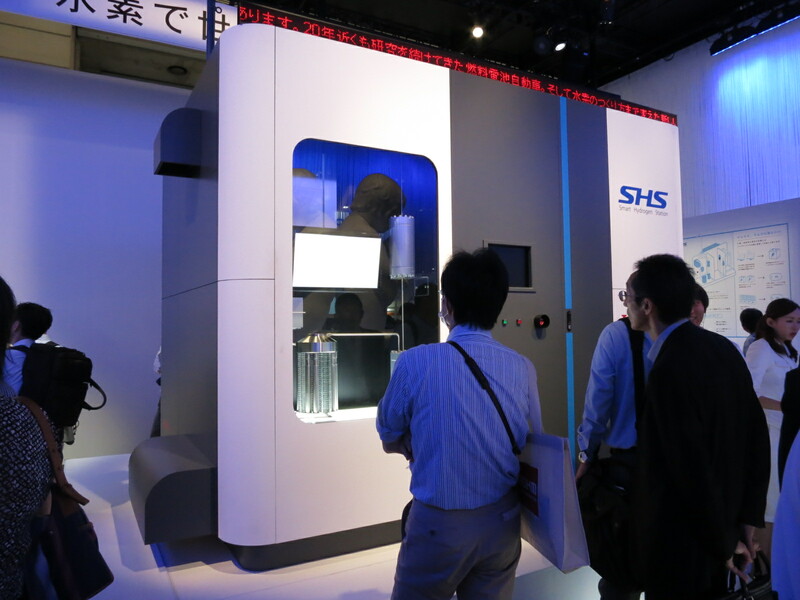 Tokyo Gas says in Japan hydraulic accumulators need to be fully protected by carbon fiber, but overseas operators can use accumulators with partial protection — a cheaper way to operate. Also, current regulations require that hydrogen stations be manned, not self-service, driving operating costs higher. Filling dispensers must be placed at least 8 meters from the nearest street, thus requiring more space, which poses a problem in crowded cities. Operators have no intention of disregarding safety, so they and regulators need to continue discussions on how rules can be eased or adjusted to promote the new business while ensuring safety, Ishikura said. In terms of space, Iwatani Corp., a leading trading house in the gas business, said it will partner with Seven Eleven Japan Co. to build hydrogen stations and convenience stores in the same facilities, apparently taking advantage of Japan’s top convenient store chain’s ability to acquire sites. 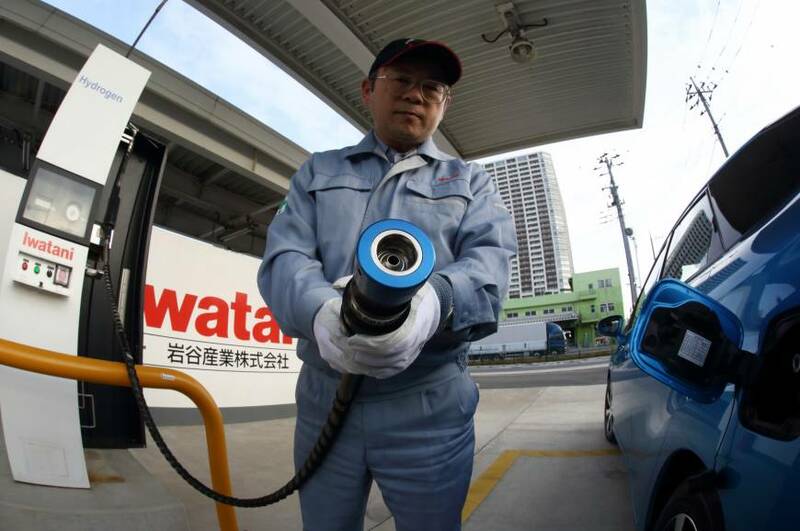 Iwatani is also teaming up with Honda Motor Co. to provide compact hydrogen stations that need only 7.8 sq. meters of space. Honda’s technology utilizes solar energy to electrolyze water to generate hydrogen, so it produces no carbon dioxide when making hydrogen. Okamoto said his firm has never said it will be running a “station business,” because the capacity and size will be much smaller than regular hydrogen stations. Many municipalities are interested in establishing compact hydrogen stations because they hope to use FCVs. But under current regulations, small stations fall in the same category as regular hydrogen stations, so it is difficult to install compact facilities in cities because they must satisfy the various safety standards, including being walled in. Okamoto said the carmaker wants the government to set new safety criteria for small stations. Oyama of Deloitte Tohmatsu said one idea to promote the spread of hydrogen stations and FCVs would be to establish cost-sharing systems, including tax adjustments. For example, people driving gasoline-powered cars would pay a little higher tax with the revenue being used to promote the spread of hydrogen stations using renewable energy to make hydrogen, because no carbon dioxide is emitted in the energy cycle — from generating hydrogen to burning it during driving. “I think some tax money should be used for such pursuits that can surely reduce carbon dioxide emissions,” he said.